The new and improved www.MentalHealthRecovery.com website is now live! 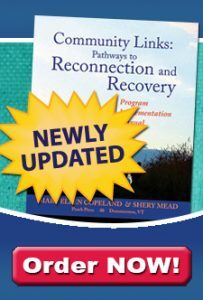 MentalHealthRecovery.com is the official WRAP website and it is now easy to navigate and find the WRAP information you’re looking for. Find out all important new features and get helpful tips and tricks to get the most out of our new site. WRAP Info Center – Is a place to look for answers about WRAP. It’s a collection of articles, forms, media and information all arranged by category in a searchable library. Dive into the articles and find out more! Read more about the WRAP Info Center. Search Fields – Looking for a specific topic, article or book? MentalHealthRecovery.com is now highly searchable and you can find what you are looking for. There are now 3 ways to search. 3) the WRAP Info Center article search, located on the WRAP Info Center pages that searches only the Info Center article database. If your search returns a result that displays a blue title, this is an article from the WRAP Info Center. However, a green title display will take you to one of our website pages or WRAP News post. Need Help NOW? – If you are currently experiencing a time of crisis and need help, the Help Now Button is on almost every page. Visit the WRAP Resources menu items to find resources, visit the Info Center to find articles about various Wellness Tools that have helped others during their most difficult times. WRAP News – This is where you can read about all of the WRAP happenings. From book specials, to conferences, webinars and more, check back often to keep apprised of all upcoming events. WRAP Share – Curious about how your peers have experienced WRAP? Looking for additional Wellness Tool ideas? Visit our WRAP Share website, www.WRAP4YourLife.com, to read about how WRAP has worked for others and find some personal stories you can relate to. Facebook – Are you following us on Facebook? Following the Mary Ellen Copeland – The Mental Health Recovery & WRAP Facebook account is another great way to keep up-to-date with all that WRAP has to offer. Find out first about the latest WRAP goings on, expand your peer circle and help support others in need – Like Us of Facebook! For further details about all these great tools and more, I invite you to visit our new website to see all the great improvements for yourself. Questions and feedback are welcomed and can be emailed to info@wrapandrecoverybooks.com or posted on Facebook. Learn, explore and Happy WRAP-ing!